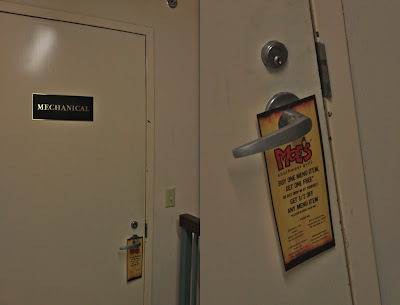 Sometime Thursday Moe's Southwest Grill attacked every doorknob in the Paul Conn Student Union with hanging advertisements. While the advertising campaign in itself was not that notable, it does beg the question: how desperate is the restaurant, which is often frequented by college students in the first place? The Moe's advertisement photographed above was hanging from the fourth floor attic door at the top of the stairway. Either a Moe's employee who doesn't know the building at all stuck it there, or it was someone with a twisted sense of humor. Let's hope it wasn't both.